MSNBC's First Read (with the name of NBC White House reporter Chuck Todd first on the joint byline) huffed and puffed on Wednesday that Glenn Beck should be fired by Fox News for suggesting President Obama is a racist. Todd & Co. lament that a "Howard Beale" like Beck would spoil the cable airwaves with these vile attacks on the president. "What's most amazing about this episode is that what Beck said isn't a fireable or even a SUSPENDABLE offense by his bosses." The White House doesn't want to give Glenn Beck a bigger platform or extra oxygen -- especially regarding his remark yesterday that the president has "a deep-seated hatred for white people or the white culture" -- so they won't comment, even off record. Beck, after all, is a radio DJ who somehow ended up getting a national platform to give his opinion on politics. What's most amazing about this episode is that what Beck said isn't a fireable or even a SUSPENDABLE offense by his bosses. There was a time when outrageous rants like this would actually cost the ranters their jobs. But not anymore; if anything, it's now encouraged. And all of this could turn ACTUAL journalists into the next Howard Beales. 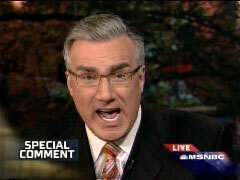 Todd and his colleagues at MSNBC hate ranting talk-show hosts who aren't "real" journalists -- like Olbermann, who was a sports anchor. We won't even remember Don Imus, who was also a talk radio jock, even when he worked at MSNBC. It's getting nuts that the folks who are creating the perception of an ideological/polarized media world are people who have never really spent their lives being journalists. Whether it's former political consultants-turned-TV execs or former radio DJs, or former California socialites, the folks helping to accelerate the public's perception of the media off a cliff made their livings trying to do other things. Are Todd and his colleagues also aware they're slapping the memory of Tim Russert as they rail away at "former political consultants turned TV execs"?